Things continue to get worse for Sears Holdings (SHLD). Fitch Ratings lowered its credit rating on the parent company of Sears and Kmart this month, warning that liquidity could be a concern beyond 2016. You can't get much worse than a double-C rating in Fitch's vernacular. The concerns here are that Sears and Kmart are showing no signs of a turnaround. Fitch sees 2014 as another year of shrinking comparable-store sales and contracting gross margins. Factor in store closings and the completion of the Lands' End spinoff back in April, and Fitch sees revenue taking a 9 percent to 10 percent hit this year. It gets even scarier as we work our way down the income statement. Fitch estimates that Sears has $1 billion annually in debt interest, capital expenditures and pension plan obligations to service. Fitch is projecting a deficit of $1 billion or worse before we get to these obligations. We're looking at an annual cash burn of $2 billion or more a year. 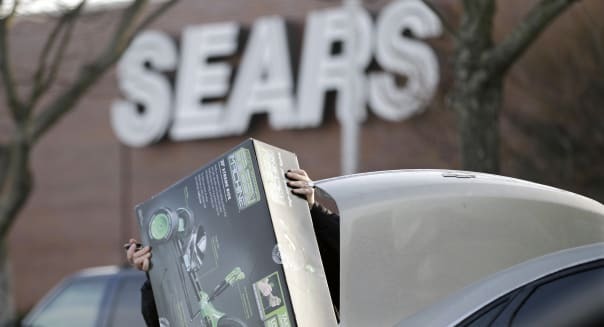 Asset sales, real estate transactions and paring back inventory purchases have helped in the past, but Sears Holdings is running out of ammo. Fitch concludes that the company behind the once-legendary Sears and the less successful Kmart chains is likely to have to restructure within the next two years. It's been three years since I originally wrote about Sears not regaining its former greatness, and things have only gotten worse. It wasn't easy. Sears is a sentimental fave of mine, and possibly even yours, too. My first job in high school was selling maintenance agreements at a Sears call center. It's now been 10 years since CEO Eddie Lampert combined the two retail concepts as a single company. Between the $3.8 billion in tax credits accumulated by Kmart and the juicy real estate that both companies were sitting on, it seemed like a logical synergy play for two fading department store operators. Unfortunately, there's been too much milking and not enough investing. Cutting corners failed to reverse negative traffic trends, and now the company has no choice but to keep shaving costs to try to keep losses in check. There's no turnaround in sight. Analysts see the annual losses continuing for years, and things could get ugly this holiday shopping season if suppliers begin to hold back on shipments if they fear that they won't get paid. It's ironic. Sears saw the value in combining with Kmart to take advantage of its billions in tax loss carryforwards, but now it's not profitable enough to enjoy them. This isn't likely to end well. Sears received a $500 million dividend from the separation of Lands' End, and it's exploring the sale of part or all of its stake in Sears Canada. Sears is running out of tchotchkes to sell, and the money that it's raising is merely going to pay debt or cover losses with little left to invest in the makeover that both tired chains desperately need. This month's credit rating downgrade is just another step down for a company that has spent the past decade going downstairs. Motley Fool contributor Rick Munarriz has no position in any stocks mentioned. The Motley Fool has no position in any of the stocks mentioned. Try any of our Foolish newsletter services free for 30 days. To read about our favorite high-yielding dividend stocks for any investor, check out our free report.